Are you short on time this holiday season? Too busy to make that special baby girl a handmade gift for Christmas? Click here to work a cute Thanksgiving jigsaw puzzle. I have searched and searched for a pattern with peacock feathers. Doily, tabletopper, shawl, anything. I have only found one pattern, a shawl that is knitted. Can anyone help me? Peacock Afghan Crochet Kit Herrschners® Exclusive! Afghan kit includes Bernat® Softee® Chunky yarn and Herrschners® 2008 Award-Winning Crochet Afghans instruction book with three additional award-winning crochet designs. Approx. 45 x 60" (114 x 152cm) plus fringe. Imported. Bless the Lord, O my soul; and all that is within me, bless His holy name. Bless the Lord, O my soul, and forget none of His benefits; who pardons all your iniquities; who heals all your diseases; who redeems your life from the pit; who crowns you with lovingkindness and compassion; who satisifies your years with good things, so that your youth is renewed like the eagle. The Lord performs righteous deeds, and judgments for all who are oppressed. He made known His ways to Moses, His acts to the sons of Israel. The Lord is compassionate and gracious, slow to anger and abounding in lovingkindness. He will not always strive with us; nor will He keep His anger forever. He has not dealt with us according to our sins, nor rewarded us according to our iniquities. For as high as the heavens are above the earth. So great is His lovingkindness toward those who fear Him. As far as the east is from the west, so far has He removed our transgressions from us. Just as a father has compassion on his children. So the Lord has compassion on those who fear Him. For He Himself knows our frame; He is mindful that we are but dust. As for man, his days are like grass; as a flower of the field, so he flourishes. When the wind has passed over it, it is no more; and its place acknowledges it no longer. But the lovingkindness of the Lord is from everlasting to everlasting on those who fear Him. And His righteousness to children's children, to those who keep His covenant, and who remember His precepts to do them. Lo, for my own welfare I had great bitterness; it is Thou who hast kept my soul from the pit of nothingness, for Thou hast cast all my sins behind Thy back. Brethren, I do not regard myself as having laid hold of it yet; but one thing I do; forgetting what lies behind and reaching forward to what lies ahead, I press on toward the goal for the prize of the upward call of God in Christ Jesus. REMEMBER WHAT WE SHOULD FORGET." This quote is from Our Daily Bread - November, 2008 Issue. Who died and was buried in Kadesh? Can you tell me the procedure you use to change the thread colors. Do you cut your MC thread? Then how do you begin your new color that you only use for 4 stitches? I carry both colors throughout most of the pattern. Carry the old color through by working stitches in contrasting color over the old color. You can drop the old color when it's not needed and then pick it back up again. This keeps both colors close to the hook making color changes easier. do you have number 59? Most times the pattern will have a set of directions in parentheses... and after the closing parenthesis it will specify the number of times. You only repeat the directions within the parentheses that number of times. 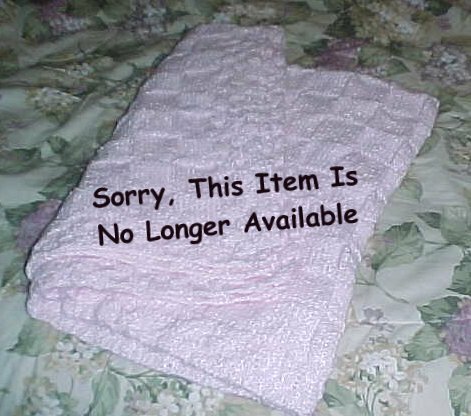 Hi trying to make a bay blanket, a free pattern from coats & clark called "crochet sweet baby blankie. Having problems with the pattern. Need 128 stitches and seem to wind up with at least double that each time. Have ripped out too many times so now I need help. It is there I think I gaining stitches but don't know how. If you could illustrate the combination for me it would be wonderful. I think if I can find out what I'm doing wrong, it should go very smoothly. I also spilled a little coffee and some got on the yarn I was using. What is the best way to fix this? Should I cut out that section and re-attach the yarn or wait till I finish the piece and then wash it? front post treble around the post of the next double crochet one row below the next single crochet. Repeat the instructions from the asterisk across to the last two single crochet stitches. Work one double crochet in each of the last two single crochets. Keep in mind... when you work the front post treble stitch around the post of the double crochet one row below the single crochet... you don't work a stitch into that single crochet stitch. I believe that may be where you are gaining stitches. As for the coffee spill... most spills can be washed out while fresh. If the coffee has dried I would cut my yarn and try washing the piece before I finished it. That way if the stain won't come out you can go ahead and start a new project. Hi. 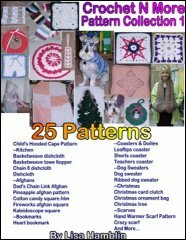 I just want to thank yu for the afghan patterns with the charts in text. I'm totally blind. 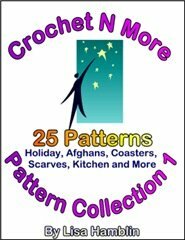 I've been looking for filet crochet and tunisian crochet patterns with the charts written out. I guess these aren't actually filet or tunisian, but they're charts I can actually work and you have no idea how much I appreciate them! 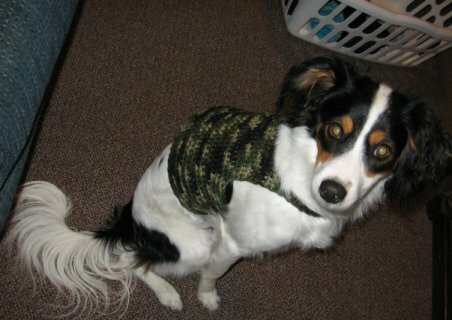 I'm also planning on making the doggie sweater for my maltese buddy. Just surfin' through, I'm seaching for easy hat patterns. I filet crochet mostly. I like crochet filet angels. Nice sight though, I'll bookmark, for easy access. Got bored Sunday and finished the sweater off today. Cute huh? the instructions were uber easy and simple to follow. This is my first time on this site, and I am looking forward to creating some new things. Thaaaaaaaank you!! I've been working with Norwegian patterns for so long, and converting to English was actually a bit difficult. But these simple, but oh so useful explanations solved it all in a go. Thanks again! I really love your page and the patterns that you post. The most importnat thing that I really wanted to say is this, I am really impressed how you stand for your faith in Christ. In this day and age where being a christian is looked down upon, you stand up. While I am not yet a christian, I recognize the power that God has and that prayer can bring. God Bless you. This website is beautiful in every way. Your story has touched my heart, and made me shed tears of joy. You are truly an inspirational woman, and not only can I tell from just your words but also your crochet patterns. I am knew at crochet but have read that crochet is one of those arts that you can find yourself in, or lose yourself in. Your Patterns don't just come from your hands, they come from your heart too. I will definitely come back to this site more often! WHILE I was working in the men's section of a department store, a woman asked me to help her choose a white dress shirt for her husband. When I asked about his size, the woman looked stumped at first. Then her face brightened. She held up her hands, forming a circle with her forefingers and thumbs. "I don't know his size," she said, "but my hands fit perfectly around his neck." EMPLOYED as a dental receptionist, I was on duty when an extremely nervous patient came for root-canal surgery. He was brought into the examining room and made comfortable in the reclining dental chair. The dentist then injected a numbing agent around the patient's tooth, and left the room for a few minutes while the medication took hold. When the dentist returned, the patient was standing next to a tray of dental equipment. "What are you doing by the surgical instruments?" asked the surprised dentist. "For instance," he said, "if you had five frogs on a log and three of them decided to jump, how many frogs would you have left on the log?" The answers from the group were unanimous: "Two." "Wrong," replied the speaker, "there would still be five because there is a difference between deciding to jump and jumping." One Sunday morning, the pastor noticed little Alex was staring up at the large plaque that hung in the foyer of the church. It was covered with names and small American flags were mounted on either side of it. The seven-year old had been staring at the plaque for some time. So the pastor walked up, stood beside the boy, and said quietly, "Good morning Alex." "Good morning pastor," replied the young man, still focused on the plaque. "Which one, the 9:00 a.m. or the 10:30 a.m. service????" "Prove to me this chair does not exist." Most of the nervous students began intently scribbling out long dissertations. But one member of the class wrote down just two words, and then handed his paper to the teacher. "I'm sorry, but I don't think we can help you here." "But I thought you delivered!" A hillbilly made his first visit to a hospital when his teenage son needed an operation. "Forgive me, Father, for I have sinned. I stole this turkey to feed my family. Would you take it and settle my guilt?" "Certainly not," said the Priest." As penance, you must return it to the one from whom you stole it." "I tried," Brian sobbed, "but he refused. Oh, Father, what should I do?" When he walked into the kitchen, he found that someone had stolen his turkey. The other day I was standing in the park wondering why Frisbees get bigger and bigger the closer they get.